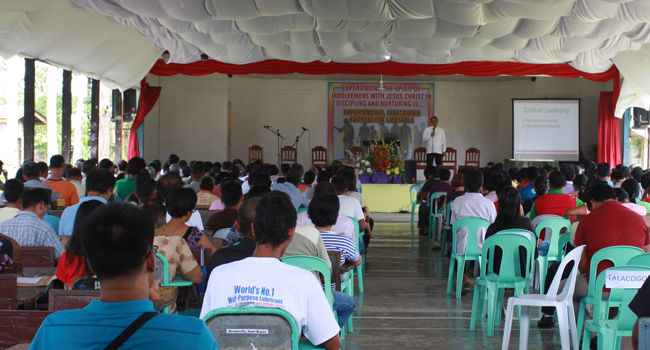 More than one thousand church leaders from the different Seventh-day Adventist churches in Caraga Region had attended the launching had attended the launching of the “Power of Seventy” at Northeastern Mindanao Academy last February 1-4, 2017. Dr. Bienvenio Mergal – the vice president of the Southern Asia Pacific Division together with Pr. Bernabe Dahunan – the IEL and NDR Director of the South Philippine Union Conference had shared their knowledge about the importance of being a true disciple of Jesus Christ. On Thursday morning, Pr. Max Dante Obbus (NEMM President), through a phone patch was thankful to the overwhelming support of the district leaders and Adventists through Caraga Region for their participation of the mission program amidst the storm. Mrs. Perlyn Panes (Children’s Ministries Director) and Mrs. Pinky Gulfan (Shepherdess International Director) emphasized the role of the children and the family to the Total Membership Involvement to the mission to preach the gospel during the Sabbath School program. Elder Edwin C. Gulfan preached and send a powerful message of putting our trust fully to God during the divine worship. He encourages the members of the “Power of Seventy” to rely on the Holy Spirit by connecting to God through his Words and to the Spirit of Prophecy and prayer. What is the Power of Seventy? The call “to go and make disciples” (Matthew 28:19) stirred the hearts of the leaders to follow the biblical principle of evangelism. The recent application of the Integrated Evangelistic Lifestyle platform as an upgrade to small group evangelism created an impact to the Seventh-day Adventist members. It helps divert the common focus of evangelism which is baptismal goal to reflecting the character of Jesus Christ through service. The Administrators of NEMM see the importance of equipping the church and providing knowledge of the doctrines of the Seventh-day Adventist Church, its history and mission. After a careful study of Elder Obbus, the administrators and the departmental directors, they created a system that will answer the need of the leaders of the church and care group. It is called “Power of Seventh.” The idea of the “Power of Seventy” is based on a biblical setup of Jesus which is to be a true disciple and to make disciples. The Power of Seventy will be trained under the “Theological Education of Adventist Missionaries (TEAM)” compose of administrators, departmental directors, theology professors, and pastors. It is under the supervision of the IEL-NDR Director and the administrators. The goal is to equip every leaders of the church, leaders of care groups and bible workers – trained them to become a disciple and a disciple maker. The first phase of the program will be until July 2017. It will cover the topics about Christ Life and Spiritual Growth, Fundamental doctrines of the Seventh-day Adventist Church, Servant Leadership, Nurturing and Discipleship, Reclamation of missing members and many others. This is a continuing education according to Elder Obbus, that will end when Jesus comes, “Do not be just a disciple, be a disciple maker,” he added. More than 500 Adventists from different parts of Caraga Region attended the Sabbath School and IEL convention at Northeastern Mindanao Mission Academy last April 20-23, 2016. The purpose of this convention is to share the latest direction of the mission of the Seventh-day Adventist in proclaiming the gospel of salvation. It aims to encourage every members of the church to participate in the different ministries of the Seventh-day Adventist Church. The guests speakers are Pastor Rudy Baloyo – Executive Secretary of the Southern Asia Pacific Division, Pr. Segundino Asoy – Sabbath School Director of the South Philippine Union Conference, and Pr. Bernabe M. Dahunan – NDR-IEL Director of the South Philippine Union Conference. The delegates were delighted to hear the inspirational message of Elder Max Dante B. Obbus our NEMM president which encourages the Adventists in Caraga Region to get involve in the ministry – a way to strengthen the faith in Jesus Christ. On April 23, 2016 Elder Rudy Baloyo spoke during the divine worship at the fully packed auditorium about the soon coming of our Lord Jesus Christ and our responsibility to give an opportunity for others to know Jesus. The Sabbath School and IEL Convention ended with a musical concert featuring the adventist musicians in Caraga Region. Pr. Jerry E. Taguno and Pr. Lonie D. Cena are grateful for the support of the district leaders, the elders and members of the Seventh-day Adventist Church throughout Caraga Region.